So it took me longer than planned to write my next blogpost! It sounds odd, but I rather fell out of simple living for a while. I felt the urge to put expensive goo on my face instead of homemade, and to buy trashy magazines. I think on reflection I was trying to do too much too fast. I was determined to make my own clothes intead of buying them, but it's quite a leap from the occasional pair of pajama bottoms to a full-on professional wardrobe. After making do and mending most admirably for some time, the combination of January sales and impending new job had me running to the shops. Not all bad, of course. I'm making it sound as if I blew a year's buget in a week. I bought clothes - but still relatively sensibly. Building on my experience with Project 333, I bought items that can be worn at work, home or socially, in a limited range of colours, in simple styles that will age well and that work well with my existing clothes. But somehow it all fell off together. The clothes, the face cream, the make-up. 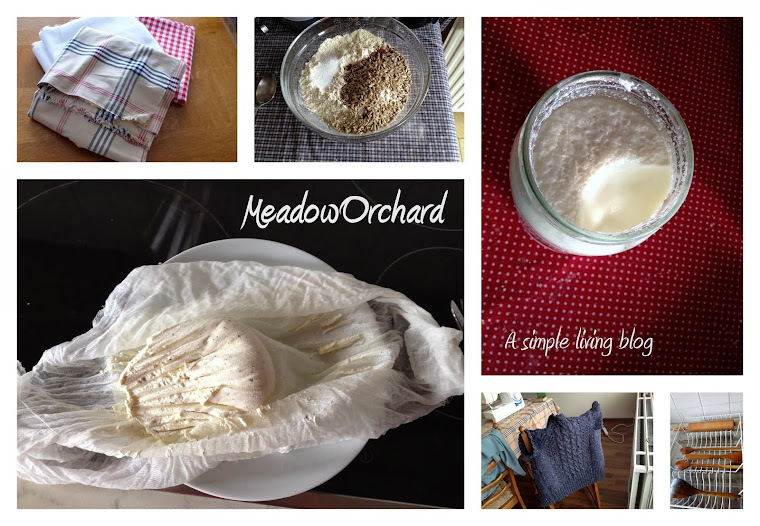 The house uncleaned, the yoghurt unfermented, quilt unquilted, the blog unloved. The last week or so I have found myself turning back to simple. It should not surprise me, but it does: I felt an almost immediate relaxing of a knot of tension I had not noticed as soon as I started revisiting my old inspirations, picking up my knitting, and caring better for the home around me. So how do you get (back) into simple living? Here are my favourites. Browse blogs, books, tv programmes etc that encourage you to slow down and illustrate all the cool things you can do. Try here or here or here. So simple. Makes the room look and feel tidier, starts you towards a morning routine, and makes you feel productive before you even change out of your pjs. Decluttering always makes you feel lighter and better able to breath, somehow. What about you, what are your favourite ways to find the simple rhythm again after a break? I think sometimes it just happens - happened to me a while ago. You don't have to do everything straight away and you have to choose what's important to you based on the life you want to live. You can't expect to make all your own clothes when you work in a corporate environment. When it happened to me, I tried to follow role models and it made me deeply unhappy. It took me a while to recognise that this wasn't the way I wanted to live and when I changed it, I felt better and now I'm back on track to achieve the goals I have set myself. Always glad to see you blogging again. I wish I could get a better handle on what I actually want to blog about.